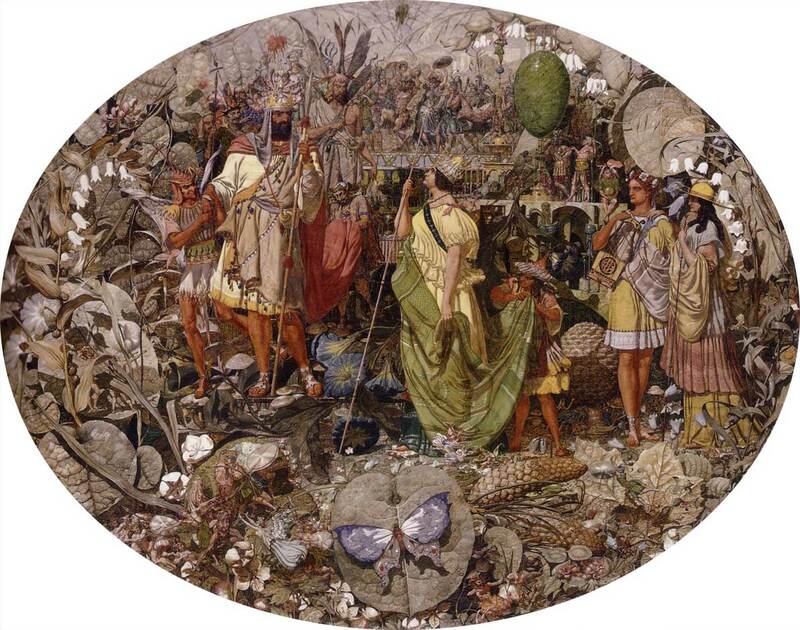 If you know one work by Richard Dadd, it is his masterpiece The Fairy Feller’s Master-Stroke, on which he probably worked for nearly a decade. 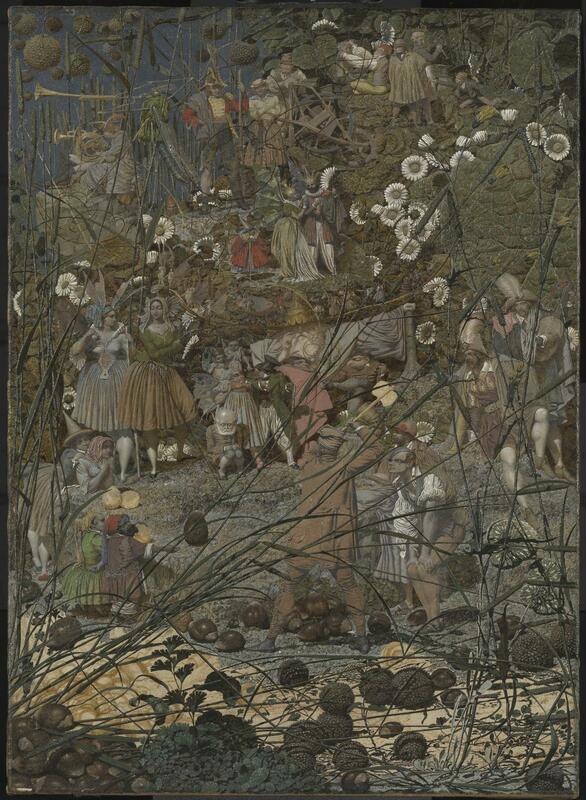 Even so, this painting now in the Tate Gallery appears incomplete: the axe being wielded by the fairy feller has not been finished, neither has much of the foreground, which remains only sketched in. I have shown how, before his mental illness, Dadd was already an accomplished creator of elaborate faerie paintings. 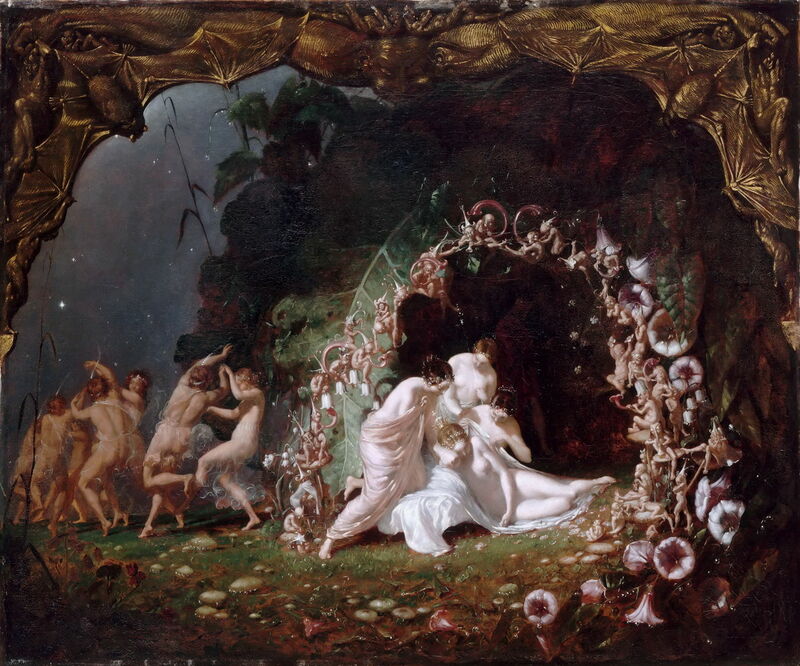 Although his Titania Sleeping (1841) may seem an odd work now, at the time such works were popular, and accepted at the Royal Academy and elsewhere. And why not? After he was confined to an institution, Dadd did not return to faerie painting for over a decade, and then in a very different style and manner. 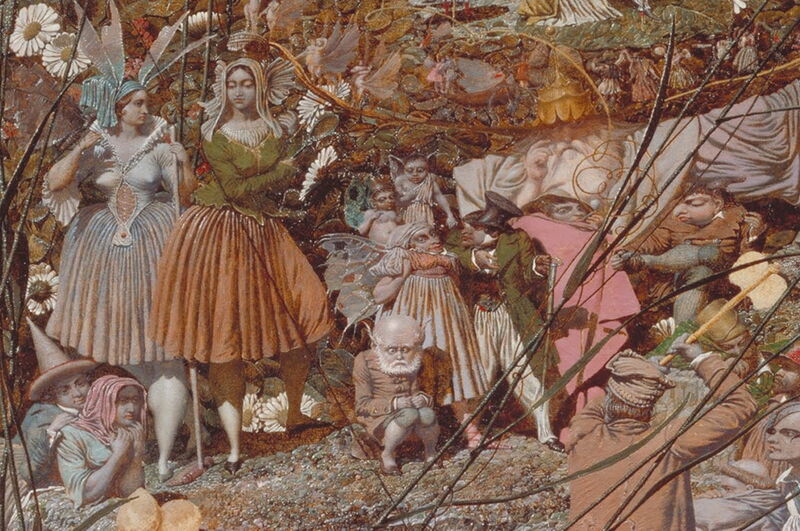 He seems to have started Contradiction: Oberon and Titania before The Fairy Feller’s Master-Stroke, and completed it as a commission several years before he stopped work on the later painting. The only clue as to why this masterpiece was left unfinished is that in 1864, Dadd was transferred to the newly-built Broadmoor Hospital, which I will discuss in the next article. Like Contradiction: Oberon and Titania, The Fairy Feller’s Master-Stroke has its origins in Shakespeare’s plays, with inspiration from Mercutio in Romeo and Juliet, and its main content once again from A Midsummer Night’s Dream. Dadd also painted a smaller watercolour version known as Songe de la fantasie (1864) which is now in the Fitzwilliam Museum in Cambridge, which does not permit free image use, I am afraid. We see Dadd’s scene through fine stalks of Timothy grass, the foreground with scattered hazelnuts and plane tree fruit. Although its perspective is flattened, the figures in the lower half of the painting are stood on a gently rising grassy sward, behind which is a steeper bank and stone walling (prominent at the right). Those in the upper third of the painting appear to be on another level, which rises more steeply towards the top edge. After he had stopped work on the painting, Dadd wrote a long rhymed verse description, titled Elimination of a Picture & its subject – called The Feller’s Master Stroke, in which he named each of the many figures and described them in turn. This is reproduced in full in Nicholas Tromans’ excellent book, and I will not attempt to summarise its summary. The scene is set in the night-time, although daisy flowers are still unnaturally open, and there is night sky visible at the upper left. 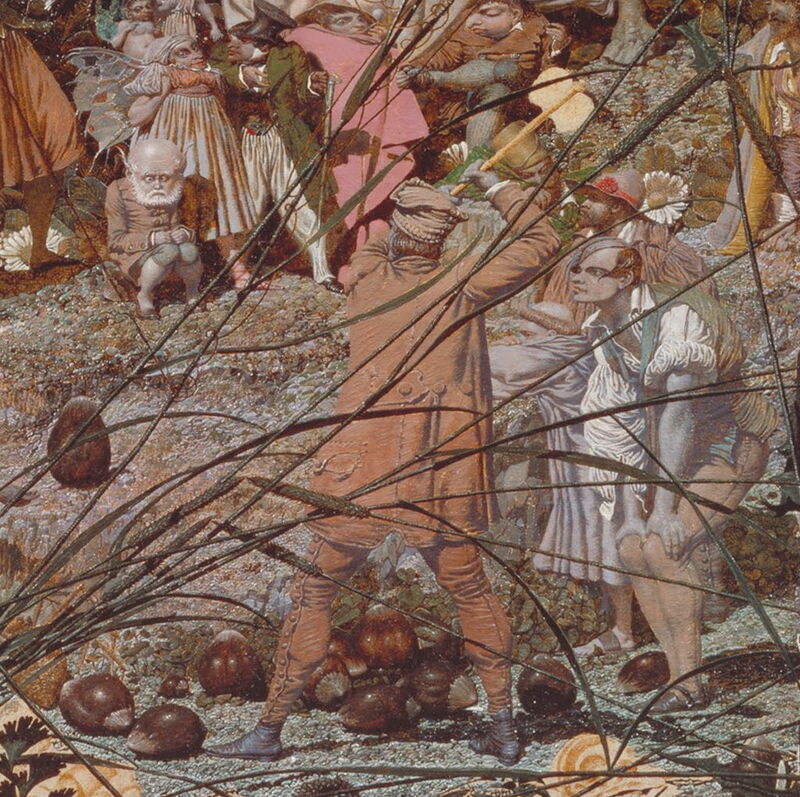 The feller himself, a hewer or fellow, seen at the centre, is about to cleave a hazelnut with his axe to provide a new carriage for Queen Mab (pronounced Maeve, to rhyme with rave), who has replaced Titania here as the queen of fairyland. Not only does Dadd mix the scaling of figures and objects, as he did in Contradiction, but their heads and other parts have become distorted as if in some sort of hidden force. Some appear almost anamorphic in form. Although the figures shown are all gathered around the feller, and watching him swing his axe, Dadd tells us that they are actually gathered “to fix some dubious point”. Presiding over this is the disproportionately large figure of the Patriarch: he has a long, white wizardly beard and a tiered crown, and is seen immediately above the distorted figure in pink (a politican), at the right of the central group. That group consists of (from the left) two ladies’ maids, with exaggerated breasts and calves, a pedagogue cross-eyed and squatting, a winged nymph with no neck, a green-coated dandy, the politician in pink, and a ‘modern fay’ satyr who is admiring his shoes. Behind the Patriarch is the tiny Queen Mab in her chariot, drawn by a team of female ‘centaurs’. Following them, to the right of the Patriarch’s crown, is a train of dancing figures. 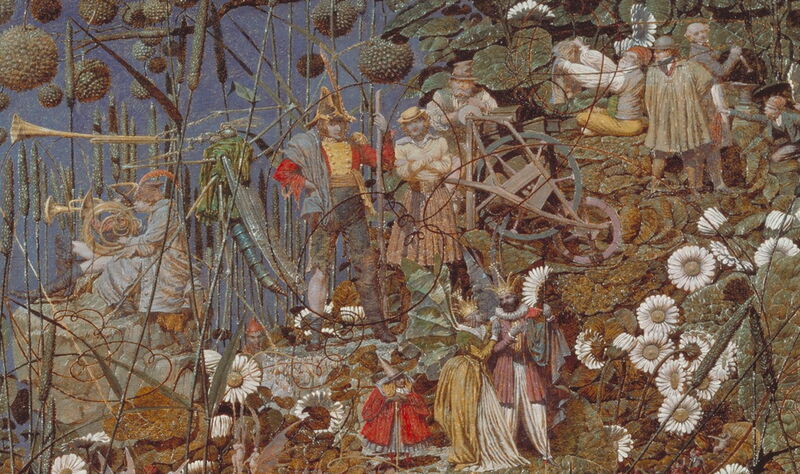 Even the distant upper section of the painting is rich in its array of characters. Trumpeters at the left include two boys, given as a ‘tatterdemalion’ and a ‘junketer’, and an insect intended to be a dragonfly. To the right of them are the characters from the still-popular child’s counting saying, of tinker, tailor, soldier, sailor, rich man, poor man, beggar man, and thief, although not quite in that order. Lower down in this detail are Titania and Oberon, apparently the best of friends after their ‘contradiction’. Dadd painted this unique work for the Steward of Bethlem, George Henry Haydon, whose interest in natural history would no doubt have been another inspiration to the artist in his imagery. The more that you look at The Fairy Feller’s Master-Stroke, the more fascinating, obsessing, and puzzling it becomes. It is Dadd as a nineteenth-century Bosch, on some seriously psychotropic drugs – a masterpiece like no other.